Representatives of different tea trade unions demonstrated in front of the joint labour commissioner's office at Collegepara here today, demanding immediate reopening of the abandoned Tirrihannah tea estate. The union leaders, who submitted a memorandum at the office, have threatened to launch an extensive movement if normality does not resume in the garden in a week. The management of Tirrihannah, around 20km from here and close to Bagdogra, had abandoned the garden on November 9, alleging that workers had prevented the dispatching of tea for auction while demanding wage dues that had piled up after the demonetisation drive started. There are around 2,000 workers in the garden. 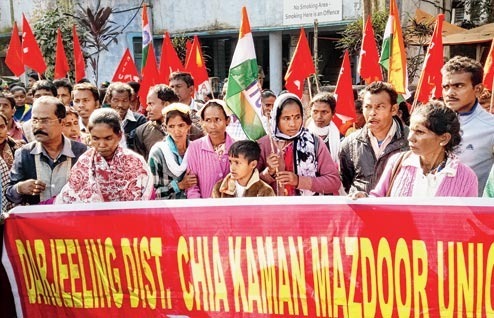 Today, over 100 workers, led by the leaders of the Citu-backed Darjeeling District Chai Kaman Mazdoor Union, the Intuc-backed National Union of Plantation Workers and the AICCTU-backed Terai Sangrami Cha Shramik Union (TSCSU), reached the joint labour commissioner's office and started shouting slogans, accusing the management of abandoning the tea estate in lean season and demanding that the estate be reopened at the earliest. The demonstration continued for couple of hours, after which the leaders submitted a memorandum at the office. "Workers of the garden have protested as the management has failed to disburse wages. There had been a delay in wage payment because of the demonetisation drive and restriction in withdrawal of cash from banks. However, almost every other garden in the Terai belt has managed to get cash according to the process stipulated by the RBI and made payments. But in Tirrihannah, the workers did not get their wages," Gautam Ghosh, the Darjeeling District Chai Kaman Mazdoor Union secretary, said. The trade union leaders, while submitting the memorandum, mentioned that both the daily-rated workers and the monthly-rated workers of the garden are yet to get a month's wage. "Due to demonetisation, workers are suffering shortage of cash. In such a situation, the garden's management has mentioned in its notice that it is not in a position to pay salaries or wages, even if necessary cash is arranged by bank. It is blatant violation of labour laws of the country," Alok Chakraborty, a senior Intuc leader based in Siliguri, said. Since November 9, that is, when the demonetisation drive was initiated by Centre, seven residents have died in the garden for various reasons, the trade union leaders said. "Among them, five were retired workers and did not get their gratuity even after retirement. 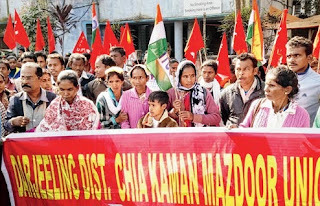 The state labour department should see to it that the workers get their dues and also, the state government extends necessary relief to distressed people," Chakraborty said. "We have made it clear that if the state fails to persuade the management to reopen the garden in the next seven days, we will be forced to launch an extensive movement," he added. Representatives of the company that owns the garden could not be contacted. Repeated calls made to them went unanswered.